Ever wondered why we share gifts on Christmas? From December 17 to 23, at the end of the year in ancient Rome, the Saturnalia and the Sigillaria were celebrated. It was the period in which agricultural tasks were interrupted until the next planting. A religious celebration that combined elements of Christian Christmas and the current Carnivals. A party in which all social classes participated and the streets were filled with people shouting ” Io Saturnalia “, “live Saturnalia”. Friends exchanged gifts. The most common gift were wax candles (cerei). In all probability, the antecedent of the moccoletti on the last night of the Carnival in Rome. The fun consists of mutually extinguishing the candles (moccoletti) that they carry in their hands. The candles symbolized the light that ended the darkness of Chaos and announced a new light or new year. As for the Sigillarias, the children received gifts consisting of terracotta figurines that were sold in the street markets, which were also called Sigillaria. In these markets, you could also find books and silver objects. Santa will be coming to town soon, and like every year, in 2018 he has plenty of cool toys to choose from. 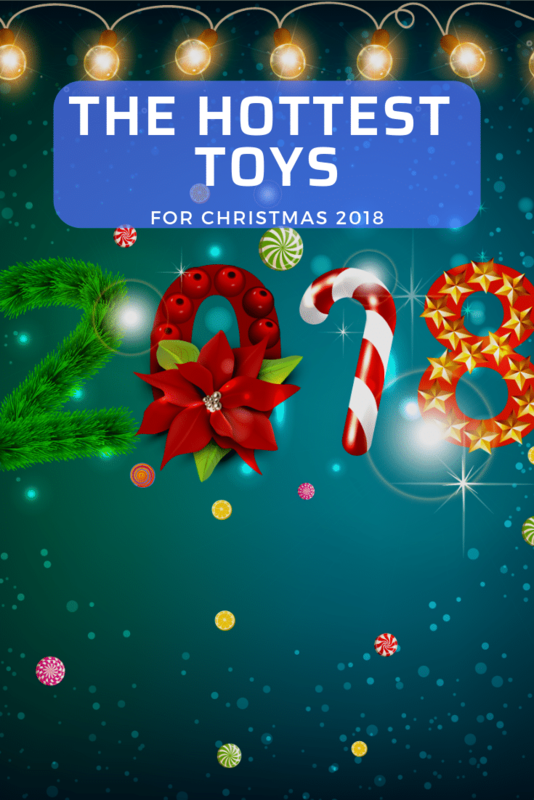 We have written this review of the best and hottest toys for Christmas 2018 hoping it can make things a bit easier for deciding the best gift for your children, be it a boy or girl. Every LOL Surprise ball is full of surprises. 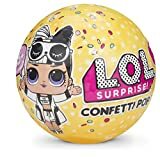 Inside the ball, you’ll get a secret message sticker, a couple of collectible stickers, a bottle charm, shoes, outfit, accessory, ring tattoo, and confetti pop. LOL dolls are going to be a hit this Xmas, so make sure to get yours with enough time. Maybe you’ll get lucky and end up with one of the collectible ultra-rare characters. This is not regular sand, but a special formula that never dries out. Although it feels wet when you touch it, it doesn’t leave your hands wet and is super easy to clean up. Not only is this fun for children, but adults can have a blast also. 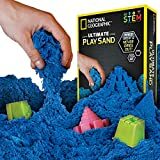 The sand keeps its shape, so it comes with six awesome molds to make incredibly detailed figures like pyramids, castles, and more. The sand is hypoallergenic, non-toxic, mess-free, and contains no wheat, gluten or casein. You can select your purchase in boxes that contain one pond, two, six, or up to 12 pounds of sand, and it comes in many colors: blue, green, natural, pink, purple, red, multi-colored, and there is even an amazing glow-in-the-dark option! Recommended for ages 3 years and up. Every child should learn to love animals from an early age, and this gift teaches them this. Each Scruff A Luv represents an abandoned pet looking for love. When you take it out of the box it is just a sad ball of matted fur, but after a nice bath and brush, they turn into an adorable pet, which can turn out to be a bunny, a kitten, or a puppy. 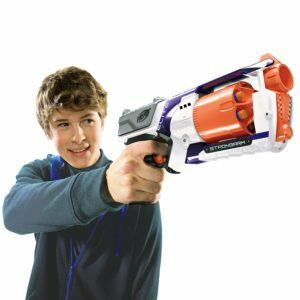 Nerf has designed this toy for quick draws and fast firing. Its barrel can hold 6 darts and shoots them up to 75 feet! 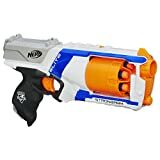 The barrel has a mechanism that flips open which makes it much easier to quickly reload the darts, and if your child already has some Nerf blasters he can use these darts with any Elite blaster and most N-Strike blaster models. 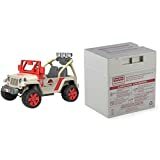 It doesn’t use batteries and is recommended for children 8 years and up. 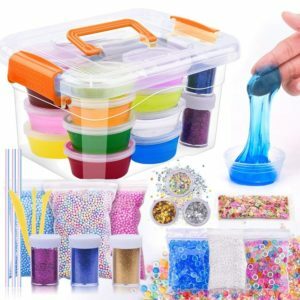 This kit will keep your kids busy and entertained for hours at a time. It is a fun pack that includes 12 colors of slime, a couple of bags with fishbowl beads, three foam bags, one with fruit slices, six jars with glitter, three straws, a set of tools, and a storage box. The slime is stretchy and non-toxic. 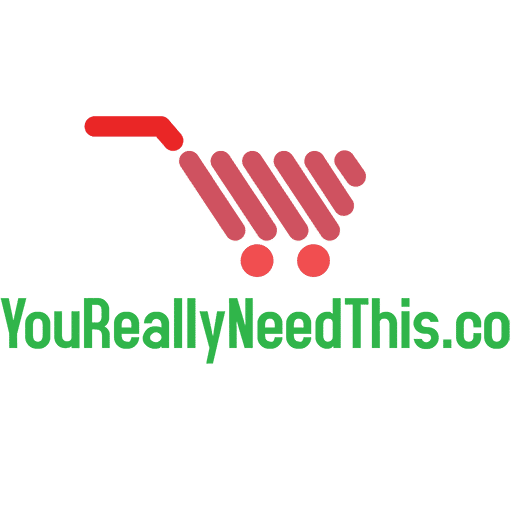 Made with eco-friendly materials, it is washable, easy to clean up, contains no harsh chemicals, and has no smell. Considered one of the most creative toys of the year, not only is this toy fun, but also educational. 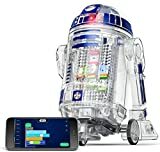 It teaches kids how to control electronics with code, and has 22 missions and challenges in the app to teach the doing new tricks and skills. It can be controlled with an Android or iOS phone and can be reconfigured in new ways to give it new abilities. The droid can detect obstacles in front of it for self-navigation, making it seem like he has a mind of his own! Recommended for ages 8 and up. Powered by front and rear dual motors, this remote-controlled truck has enough torque to move on almost any terrain it can find. Each wheel has an independent suspension system with shock absorbers and is made of PVC rubber, which is soft, elastic and anti-skid. The elevated design allows the truck to drive over anything without damaging the body and can perform on pavement, gravel, mud, grass, or sand. It includes a 6v 800 mAh rechargeable battery and a 2.4 GHz controller. The front headlights light up to give it a super cool and realistic look. Age recommended 8 years and up. Featuring Jurassic Park graphics and styling that make it look just like the ones in the movie, this Jeep has a pretend radio with realistic dinosaur roars and driving sounds. If you want to store some extra toys for the road just put them in the roomy storage area. The Jeep is powerful enough to drive two kids to their next adventure since it supports up to 130 pounds and has doors that open and close. 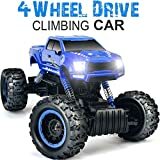 There is a real working light bar, power locking brakes that will stop the vehicle as soon as your kid takes the foot off the pedal, and can drive on hard surfaces and grass. The details that went into this product is amazing. 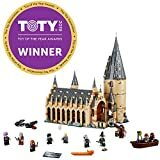 Once you build this Harry Potter building you will find the house banners, a tower with a movable spiral staircase, a potions room, and even a treasure room! 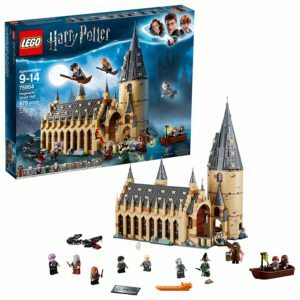 It also includes 10 figurines: Harry, Ron, Hermione, Draco, Susan Bones, Prof. McGonagall, Prof. Squirrel (with dual Voldemort face), Hagrid, Albus, and headless Nick. The building measures about 14” high and is made of over 800 pieces, enough to keep your kids entertained for a long time. 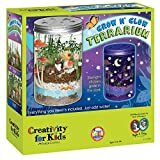 Let your kid enjoy and experience the wonder of nature by crafting, planting, watering and growing his own terrarium tabletop garden. This kit includes everything that is needed for two complete plant cycles: a plastic mason jar with decorative lid, organic chia and potting mix, wheat grass seeds, garden figurines, sand and river stones for decoration, and a plant mister to keep the plants watered. 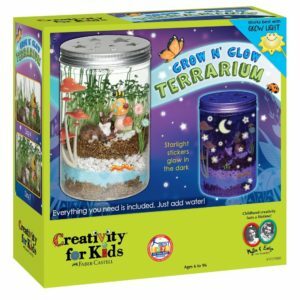 The kit also includes glow-in-the-dark stickers to light up the terrarium at night. Once planted, the chia and wheat grass seeds will sprout three or four days later. Recommended for ages 6 and up.